Goodreads: As a successful journalist at Good Morning America, Mary Pflum Peterson's persona is at odds with her complicated childhood, where she watched her brilliant yet emotionally vulnerable mother, Anne, unravel before her eyes. But their love of white dresses always united them—from their baptism dresses to their wedding gowns, white dresses embodied hope and new beginnings. After her mother's sudden death, Mary dug deep to understand the events that led to Anne's breakdown. At twenty-one, Anne entered a convent, but lengthy periods of enforced fasting, isolation, and constant humiliation drove her to flee almost a decade later. Hoping to find new purpose as a wife and mother, she married, and was devastated when Mary's father revealed himself to be gay. Anne retreated into chaos. By the time Mary was ten, their house was cluttered with broken appliances, stacks of mail, and teetering piles of assorted "treasures." But in spite of everything, their bond endured. Through the white dresses, pivotal events in their lives were celebrated, marking the journey through loss and redemption as Mary tried to save Anne from herself. Kritters Thoughts: A memoir that was unique from page one as the author told more of the story of her mother than of her own and I am used to memoirs being mostly about the author's own experiences. The other thing that made this one unique that I did like was having a central theme to the book - White Dresses. I love how each story is centered around a white dress and made me realize how many white dresses can be present in a woman's life. 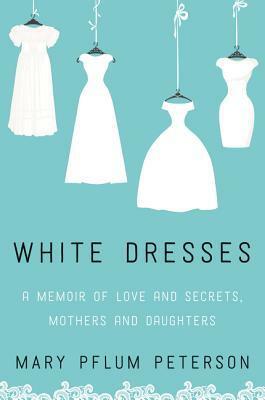 It challenged my view of how we visualize big moments and place white dresses in our lives. I never realized how many moments in a girl's life not only were centered around clothing, but also contained a white dress. I also loved that her mother although, yes a hoarder, placed a value on these dresses and the daughter could walk through both her and her mother's life through a closet of white dresses. I agree with the many reviews that I read after reading the book that it had a slow start, but stick with it and you will enjoy a mother/daughter relationship told in an interesting way. There's so much to this story - I'm glad you and other readers are recommending to stick with it!